This website has grown out of an informal alliance of breastfeeding mothers, a midwife, midwifery support workers, children's centre staff and a photographer all based in Hampshire, UK. We are building a photographic picture library of images that document the many different ways mothers breastfeed their babies and children in everyday situations, both at home and particularly out and about in public. We hope the images will inspire women who are breastfeeding or thinking of breastfeeding to become more confident about how, when and where they can breastfeed. The library is also a resource for professionals and others engaged in breastfeeding promotion and education. Earlier this year members of WDIIP were invited by Southampton City Council to contribute to a project to mark WABA / World Breastfeeding Week. Jayne, a midwife and an IBCLC INTERNATIONAL BOARD CERTIFIED LACTATION CONSULTANT, was on the advisory group and Paul was commissioned to work with local breastfeeding women to take a special set of photos showing them breastfeeding their children in locations that would be recognisable to other Southampton women. The idea behind the project was to fuse art with public health promotion - to produce a set of photos which were beautiful, local and which captured the naturalness of breastfeeding in public. 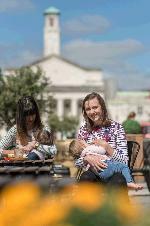 We hoped that by celebrating breastfeeding in public in iconic City locations, that more local women would be empowered to feel confident and comfortable about breastfeeding while out and about with their children. We see this shift in culture as an important part of a move towards Southampton becoming a more baby-friendly city. Full story here . . .